All of the data we obtain for our internal database is scrubbed and updated through invitations to attend over 150 Tech M&A events yearly, either our own, or those we sponsor or financially support. Each year they are promoted to over 150,000 contacts in each of the 26 industries our research group tracks and every corner of the globe. These in-person and online events serve to update the database, and teach not only sellers, but, more importantly, buyers. The feedback and networking from these events (more than all other competitors combined) helps build critical relationships with the strategic buyers, private equity, and venture capital. 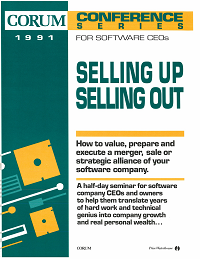 The Merge Briefing, a 90-minute executive briefing providing a current software M&A update (trends, valuations, etc. ), as well as a brief overview of the Tech M&A process. 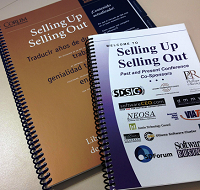 The half-day workshop “Selling Up, Selling Out,” which outlines how to prepare, position, research, value, negotiate, and execute due diligence for maximum price and structure. This is the most attended Tech M&A event ever – participants have done over $1 trillion in transaction value. The half-hour Tech M&A Monthly webcast, featuring up-to-date content and statistics reflecting both the M&A market of the last month, and perspective on where it is going. Finally, Corum is a Platinum sponsor of World Financial Symposiums (WFS), an international organization dedicated to educating technology leaders with a focus on software and Internet M&A and finance.